Today I am sharing my DT project with Morgan's Art World I just love this her and it's the image of the month at Morgan's Art World on Facebook. She is free for members for the next three days. This is a closed Facebook group but you can still join after you sign up and are added to the group. 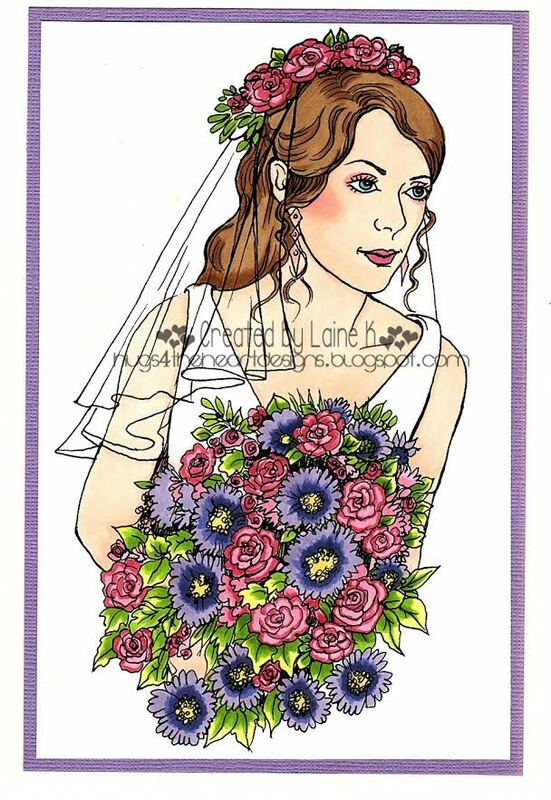 I just love this gorgeous bride image and she was fun but a little intimidating to color. In all honesty, I have to learn how to color veils and other sheer items and hopefully it's a class Alyce - Kit and Clowder. I hope you will join in the June Challenge and looking forward to seeing what you create with this gorgeous image from Morgan. Thanks so much Bunny. I really appreciate your stopping by. Wow this is stunning and what an amazing image. I love it. Beautifully coloured too. Nice work. Oh Annette thanks again for stopping by and leaving such a wonderful comment. I really appreciate it. Your choice of colours showcases this gorgeous image perfectly.A very pretty card. Awesome coloring and a beautiful card! Thank you for joining the fun at ABC Challenge! Good luck and be sure and join us again! It's all about a "Coffee Bath"